Made by Dallan in United Kingdom, Europe, c.1959. The German-made large format Linhof Technika bellow camera was distributed around the world from its manufacturing plant in Germany from around 1950. As a relatively lightweight and portable, sturdy and durable ‘field’ camera with an optical range finder, it became the camera of choice for many applied photographers. Linhof Technika camera with attached Schneider 127mm lens (Serial Number 2360420) and black plastic metal lens hood with ultravoilet lens filter inserted. The camera also comes with a silver metal cable release, a black plastic Leica lens cap and an aluminium sports finder. The camera's accessories are: a box (packaging originally for Kodak 4 x 5 inch sheet film) containing an envelope and a 4 x 5 inch glass focusing screen for the rear of the camera; 'Western Master V' Universal exposure meter; portable Dallan developing tank; and a book titled 'Linhof Practice: an introduction to Linhof Cameras, their accessories, and photographic technique'. This camera was made by Linhof Präzisions-Systemtechnik GmbH in Germany, c.1959. The accessories were made by various makers including Kodak Pty Ltd, Sangamo Weston Ltd and Dallan. 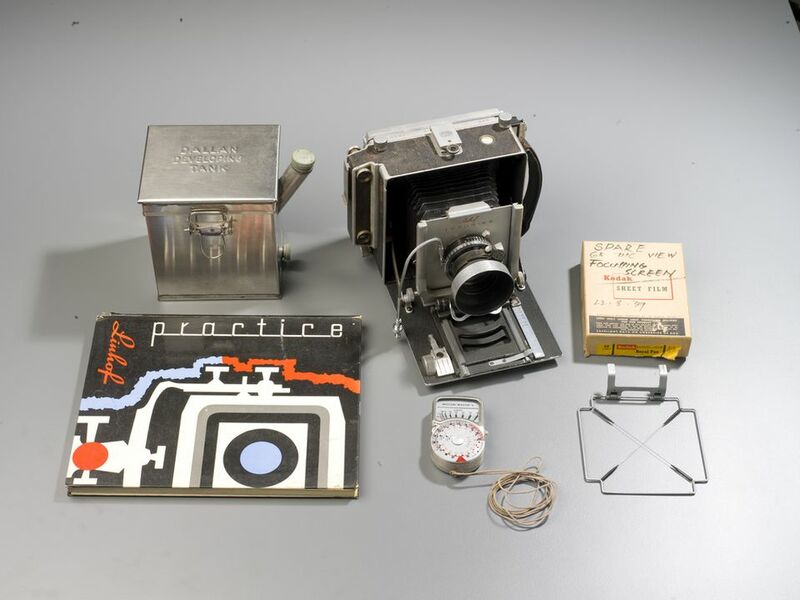 Although the Linhof Technika camera was manufactured in Germany from around 1950, other Linhof camera models have been around since the early 20th century, including the Linhof Satzplasmat (c. 1925-1932) owned by German-Australian photographer Hedda Morrison (see object 92/1417). This particular camera belonged to Sydney-based Australian photographer, Max Dupain (1911-1992). The camera was acquired from the Max Dupain studio when Dupain downsized and moved his studio into the L&P Photographics Building at 96 Reserve Road, Artarmon. Dupain used this camera for many years, mainly for architectural photography. The camera and some of the accessories were displayed in the exhibition 'Creating the look: Benini and fashion photography' (July 2010 - April 2011) where they provided context and support for some of the photographer Bruno Benini's most iconic 5x4 inch photographic negatives and prints that Benini produced on his own Linhof Technika during the mid-1950s.